When most people think about cancer treatments, what typically come to mind are the side effects of traditional chemotherapy: cardiac, liver, and renal toxicity; hair loss; nausea; fatigue—just to name a few. These side effects occur because the cancer drugs damage not just cancer cells, but healthy cells as well. “Targeted” cancer therapy, on the other hand, is designed to target just the cancer cells. Some targeted therapies achieve this because they only attack cells with a particular molecular signature; others are directed to the cancer by physical means. Today, I’d like to introduce you to a researcher who’s developing a targeted drug delivery strategy that uses lasers and light activated drug delivery to fight cancer. Jonathan Lovell, a Canadian-born researcher at the State University of New York at Buffalo (UB) and recipient of the NIH Director’s Early Independence Award, has designed unique nanosized spherical pods—1/1000 the diameter of a human hair—that open when light shines on them and snap shut in the dark. Lovell will fill these pods, also known as liposomes—hollow fat droplets—with anti-cancer drugs. He’ll then inject them into the body, where they’ll circulate, safely and silently: until they’re activated. When Lovell shines a red laser on the tumor, the light triggers the balloons to open and deliver a blast of the drug—only where it is needed. (Red light penetrates human tissue better than other colors.) It’s a terrific example of how bioengineering can bring fresh solutions to longstanding medical challenges. So, how did Lovell become a bioengineer? He began with an undergraduate degree in systems design engineering from the University of Waterloo. He quickly realized that an office job didn’t appeal to him. Intrigued by medical stories he’d read in newspapers and popular science magazines, he decided to complete a master’s degree in biochemistry. It was a good move. He loved working in a lab with other scientists. He also realized his passion for applied research, where he could develop tools that would improve health. It was while attending a talk, though, that he chanced upon the specific type of tool he hoped to develop. The speaker described the pioneering work of Gang Zheng, a bioengineer at the University of Toronto who was designing nanoparticles and light-activated “smart drugs” that could specifically target tumors. Lovell wrote to Zheng and asked whether he could come to his lab to complete a PhD. Soon, Lovell headed to Toronto. After completing his PhD, Lovell accepted a faculty position at UB, where he began to tweak the vesicles he created during his doctoral work. He didn’t just want these nanoparticles for imaging; he wanted them to pop open. As he played with the chemistry, he discovered that, by changing the type and quantity of porphyrins and phospholipids attached to the liposomes, he could make the nanoballoons pop open when exposed to beams of laser light. Lovell has shown, in test tubes and in mice, that these balloons, dubbed PoP-liposomes, will open when the light is on and snap shut when the laser is off . 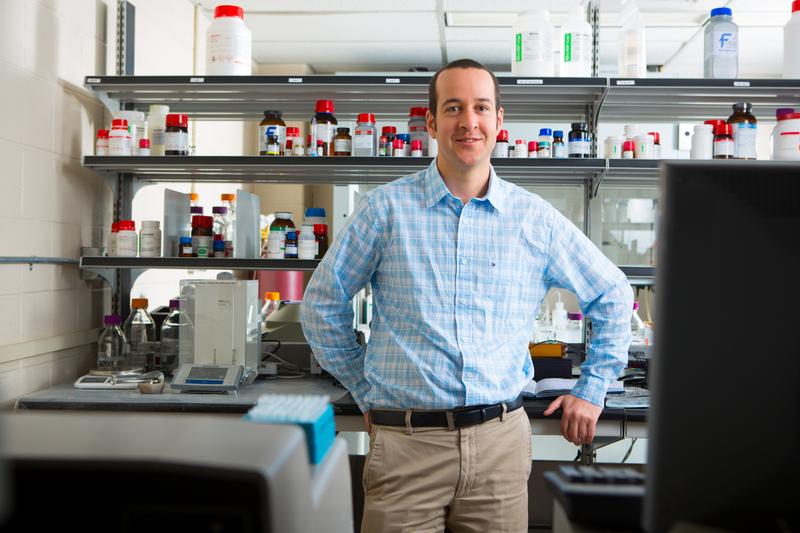 With his Early Independence Award, he plans to test the PoP-liposomes rigorously in animals to figure out how they eliminate tumors without harming other tissues. If this works, human trials could begin as soon as a few years from now. That’s not all these PoP-liposomes can do. This is a 2-for-1 technology. As they release their therapeutic cargo, the liposomes also collect proteins and hormones from the tumor microenvironment, providing a tiny biopsy—which could then be analyzed to fine tune the treatment. Porphysome nanovesicles generated by porphyrin bilayers for use as multimodal biophotonic contrast agents. Lovell JF, Jin CS, Huynh E, Jin H, Kim C, Rubinstein JL, Chan WC, Cao W, Wang LV, Zheng G. Nat Mater. 2011 Apr;10(4):324-32. Porphyrin-phospholipid liposomes permeabilized by near-infrared light. Carter KA, Shao S, Hoopes MI, Luo D, Ahsan B, Grigoryants VM, Song W, Huang H, Zhang G, Pandey RK, Geng J, Pfeifer BA, Scholes CP, Ortega J, Karttunen M, Lovell JF. Nat Commun. 2014 Apr 3;5:3546. Laser and Nanoballoons are latest techniques for the cancer treatment. This blog enables me more information about different types of technique for the cancer treatment. I want to know nanoballons for the cancer treatment. I would like to tell you that there are many Ayurvedic therapies which are helpful for the cancer treatment.